Sometimes a scent translates as visual to me. I see a landscape, or even a particular room or person. Sometimes, though, a fragrance feels like music. Its notes are high-pitched or deep and sonorous. To me, L’Inspiratrice by Divine smells like Debussy’s Clair de Lune heard from outside the concert hall on a warm evening. It is elegant, entrancing, and bohemian, but always civilized. Perfumer Richard Ibanez created L’Inspiratrice, which was released in late 2006. The Divine website lists L’Inspiratrice’s notes as patchouli, rose, ylang ylang, bergamot, peony, white musk, vetiver, vanilla, and tonka bean. It also purrs with rounded aldehydes that give the scent a decidedly French feel. L’Inspiratrice contains rose, but it isn’t big and fruity. Vanilla and tonka add a smell almost like honey, but strangely not all that sweet. L’Inspiratrice’s patchouli is soigné but definitely present, and it is the patchouli that sets L’Inspiratrice apart as the rebel sister of Divine and L’Ame Soeur. Sure, she was born with a silver spoon in her mouth, but she’s seen the inside of an artist’s studio or two and she can live comfortably in a fifth-floor walk-up with the bathtub in the kitchen. Just don’t ask her to do her own laundry. All of Divine’s feminine fragrances feel ladylike to me, and L’Inspiratrice is no exception. The Divine feminine fragrances reject the “jolie-laide” elements that leather, dirty musk, some spices, or indolic flowers can add and instead embrace beauty purely and simply. 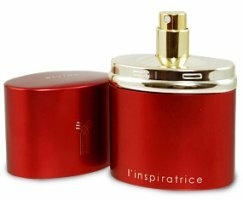 Like the other Divine scents for women I’ve smelled, L’Inspiratrice floats without a strong bottom end and leaves me sniffing my arm trying to get at a ground that isn’t there. But if L’Inspiratrice did complete itself with a base of something firm and deep it might not be as intriguing. If I could have only one bottle of a Divine fragrance, I’d choose L’Homme Sage. But next on the list is L’Inspiratrice, and I cherish the decant I have. After all, who wants to listen to the Clash everyday? Sometimes an aria from La Bohème is perfect, especially when it drifts from the balcony next door as you push open the bedroom window catch the summer night’s breeze. Divine L'Inspiratrice is an Eau de Parfum. For buying information, see the listing for Divine under Perfume Houses. Divine is a house I love, and you've captured its spirit perfectly: it's classical French perfumery, not the “jolie-laide” school. I love both and can alternate between the dirty, intimate musk of Miller Harris L'Air de Rien and the gentle aldehydic rose shimmer of Divine L'Ame Soeur, also sensuous in her own way with her vanilla-ambergris base. You're right, they don't do heavy bases, but they have a drydown that's sufficiently complex to keep me interesting. For anyone coming to Paris, Divine now has a stand-alone shop near Opera where you can refill your flacon once it's empty. It's managed by the wife of the founder, Mme Mouchel, a charming lady! That's “keep me interested” , of course… Tough actually, I guess it also keeps me “interesting” for anyone who comes close enough to smell my sillage! Divine really does stand alone among the niche houses for its classical focus. I wonder what the boutique looks like? I'm imagining whitewashed boiserie and a big crystal vase of flowers. It's hard to imagine there are people out there who actually finish a whole bottle of perfume–any perfume! But I love the idea of being able to refill your flask. Angela, what a lovely review. You make me want to try this, despite it not sounding like “my kind of thing”. Who knows? It sounds like this is one perfume house that lives up to its name! Thank you! I'd love to know what you think of it if you do try it. Oh…you've described this one perfectly Angela! I tried L'ame Soeur first and it is very beautiful. L’Inspiratrice is the sister of L'ame Soeur with a bohemian edge…perfect! This one I think is a little more interesting, a little more diverse, but I can see a time and a place where both would shine perfectly. This is a really interesting line of perfumes! I'm glad you liked the review! Both L'Ame Soeur and L'Inspiratrice are lovely. Make sure you try the men's scents, too–they're pretty great.